Reported public company debt stands at record levels. Central banks around the world have kept interest rates extraordinarily low for the last decade and this has created a Global Debt Problem. Institutions have even pursued negative interest rate policies across Europe and Asia. This environment has created enormous incentive for borrowing and has resulted in excessive financial leverage at corporations. We predict a huge spike in junk bond defaults as we enter the next decade. 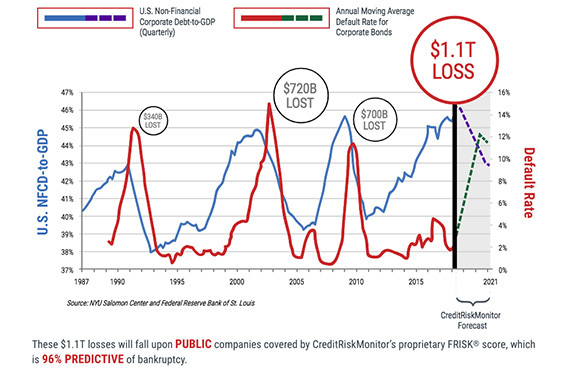 According to CreditRiskMonitor’s forecast, when this business cycle ends, debt losses will far exceed $1 trillion USD for public companies. “We expect $1.1 trillion in debt losses during the next credit contraction, but the problem is that trade credit almost always receives payment after debtholders.” said Jerry Flum, CreditRiskMonitor CEO. “What’s more troubling is that a majority of dollar exposure is with public companies, not private companies. Rising interest rates, currently being pursued by the Federal Reserve, is the pin that could prick this debt bubble. In the last few years, short-term base lending rates have already increased by more than 200 basis points – a notable uptrend. Corporate default and bankruptcy clearly affects investors and lenders, however; credit departments (with unsecured trade dollars) and supply chains (having risk of disruption) are highly exposed too. On average, one out of every four debt defaults leads to a corporate bankruptcy filing during normal economic periods. Given that every economic expansion inevitably ends, the risk management dilemma will be working through the financial loss that arises from a relatively higher number of bankruptcies. As a risk professional, whether you are working in corporate credit or within the supply chain, it is critically important to identify and manage your company’s exposure to high-risk public companies before the “storm” hits. CreditRiskMonitor offers the FRISK® score – a predictive scoring model that is 96%* accurate in measuring public company financial stress and bankruptcy risk. The FRISK® score scale, shown below, separates financially healthy businesses (best being “10”) from the ones which pose a severe bankruptcy risk (worst being “1”). CreditRiskMonitor's proprietary FRISK® score and global coverage of 58,000 public companies allows subscribers to quickly and accurately track risk exposure, simply done by counting from "1" to "10." The FRISK® score is calculated every day precisely so that users receive the most up-to-date measure of risk on their commercial counterparties. In total, about one-third of all FRISK® scored public companies globally are trending in the “red zone,” the bottom half of the scale. Companies within this category have elevated financial stress and failure risk. CreditRiskMonitor subscribers, which include risk professionals employed by more than 35% of the Fortune 1000 and many other large corporations worldwide, have many resources at their disposal to protect against counterparty risk exposure. Additional key features of the CreditRiskMonitor service include predictive financial risk models, proprietary subscriber crowdsourcing, bond agency ratings and commentary, timely news alerts, standardized financial statement spreads, peer analysis and many other useful tools. Most importantly, the FRISK® score is a simple-to-use first line of defense that will keep you prepared for the next economic crisis.